John Bakker, executive director of the Michigan Asparagus Advisory Board, discusses the 2014 harvest in Michigan during a visit to the organization’s research farm near Hart, Michigan. 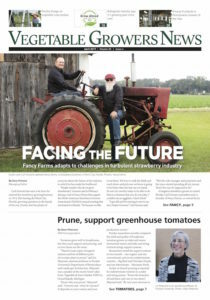 Bakker anticipates the 2014 crop yield would be similar to 2013, in which growers produced 20 million pounds of asparagus, with about 12 million of that going to processing. Increased efforts to push the fresh market could see it reach 50 percent this year.